They waited six years for a chance to hear him in person on American soil. Now that they have, many are walking away frustrated from their encounters with Tariq Ramadan, the grandson of Muslim Brotherhood founder Hassan al-Banna. "And Mr. Sarkozy was furious. He said, 'What do you mean a moratorium? Don't you condemn it out of hand? What are you saying - that we just stop it a little bit, discuss it, and then continue it?' "
During his Cooper Union appearance - where he spoke before an overwhelmingly supportive audience - Ramadan was on a panel with Dalia Mogahed of the Gallup Center for Muslim Studies, Joan Wallach Scott of Princeton's Institute for Advanced Study, and George Packer of the New Yorker. The moderator was Jacob Weisberg of Slate magazine. 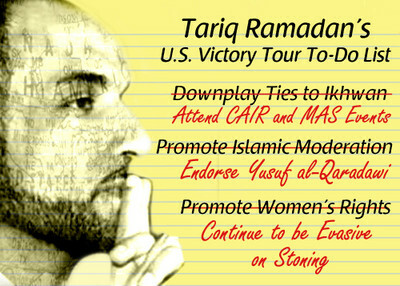 when is Tariq Ramadan comin to Philadelphia? "By the end of the evening, I knew the answer. Ramadan is building a worthy bridge on a rotten foundation"